Keratoconus is a progressive eye condition that causes the cornea to thin and bulge. While a normal cornea is smooth and round, a cornea affected by keratoconus becomes cone-like. This irregular shape affects how light enters the eye and alters the way it focuses on the retina, in turn distorting vision. Determining the right treatment option for keratoconus largely depends on the severity of the condition. Austin Eye stays abreast of the latest technologies and treatment options for keratoconus. We also use the most advanced diagnostic tools to evaluate each patient and determine the best course of treatment. Learn more about the treatment options we offer for keratoconus in this blog post. Blurry or distorted vision caused by early or mild stages of keratoconus can be treated with prescription eyeglasses and soft contact lenses. Although glasses and contact lenses don’t stop the progression of the condition, they serve as a simple way to restore vision affected by the bulging of the cornea. However, as the condition progresses, patients will notice their vision worsening and may need to change their prescription more frequently. Not to mention, it becomes nearly impossible to wear contact lenses as the bulging of the cornea worsens. Mild stages of keratoconus can also be treated with corneal crosslinking. Unlike glasses and soft contact lenses, corneal crosslinking can stop the progression of keratoconus. The innovative treatment involves applying riboflavin (B12) drops to the eyes to strengthen the collagen bonds in the cornea and stop the bulging of the cornea. Studies have found that the in-office procedure can often eliminate the need for corneal transplantation in the future. Corneal crosslinking can be used in combination with other treatment options to treat moderate stages of keratoconus. When prescription glasses or soft contact lenses are no longer a viable option for keratoconus, our team may recommend rigid gas permeable (RGP) contact lenses. RGP lenses, which are harder than soft contact lenses, can correct the abnormal bulging of the cornea and improve vision. 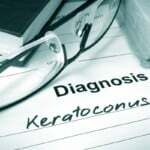 Moderate stages of keratoconus can also be treated with Intacs. Intacs are small plastic inserts placed under the surface of the eye to flatten the conical shaped cornea. The corneal ring implants are placed in a quick, simple and reversible in-office procedure. In many cases, Intacs are able to provide long-term vision improvement and help patients avoid the need for corneal transplantation in the future. When all else fails, a corneal transplant is considered. The procedure involves removing the bulging corneal tissue and replacing it with healthy donor tissue. Although the corneal transplant procedure is safe, it is still a serious surgery that comes with inherent risks. However, thanks to advances in ophthalmology, corneal transplant surgery is no longer necessary in many cases. Less than 20 percent of patients undergo this surgery. The only way to find out the best treatment option for you is to schedule a consultation with one of our board certified ophthalmologists. Contact Austin Eye by calling our North office at (512) 250-2020 or our Central office at (512) 454-2020.